Nearly every fish or other sea critter is edible, but not everyone is edible raw. Raw fish has been in fashion in the West for some time, but sushi and sashimi have been part of Japanese cuisine for centuries. Follow their lead to see which fish you can eat raw. You will often find me saying that you can use “any fish you’d find in a sushi bar” for any of the raw dishes I feature on this site. What does that mean? Salmon, although more on this popular fish later. Clams, scallops and abalone — although not oysters, which while tasty raw, don’t go well with sushi rice. Yellowtail, a type of jack fish called hamachi in Japanese. My favorite raw fish. Halibut or flounder, known as hirame in sushi-speak. Squid, which is typically flash-cooked for a few seconds. Gizzard shad. Yep, this bait fish the Japanese call kohada is esteemed in some circles. I like it because it is fishy — but not in a bad way. All forms of mackerel, saba or aji in Japanese, although they are always treated with vinegar before serving. Seabass, porgies and snapper. All are bass-like fish, and all are commonly seen in sushi places under the names of tai and suzuki. These too are often treated before serving raw. Now I will add this one: Any farmed fish from the United States, Norway, Britain, New Zealand, Canada or Japan. These countries have strict standards about cleanliness and you will not find parasites in their farmed fish — even freshwater fish such as trout or sturgeon. Did I say parasites? Yep. I did. Parasites are a fact of life when you eat meat, and that’s one reason why humans decided to cook their food thousands of years ago. Heat kills worms. So does frost, but some can survive a home freezer (although not a good box freezer). This is why I would recommend to you that all seafood you decide to eat raw be previously frozen. It is just safer that way. Yes, fresh is better in most cases, but even professional sushi chefs freeze their salmon first — salmon is unusually susceptible to parasites. The critters you need to worry about are cod worms, seal worms, and tapeworms. Cod worms are of course found in cod, haddock, pollock, and hake. They are easily visible to the naked eye and are easily removed — if you catch them. Good New England fish houses “candle” their fish by putting the fillets on a light box to detect the worms. Now you know why cod is never seen at a sushi bar. Seal worms are found in salmon, mackerel, Pacific rockfish, jacksmelt, some halibut and other flounders — even shad on the West Coast. This is why mackerel are treated with vinegar in sushi preparation. These worms are little brown things that curl up like a spring. You can miss them if you don’t look carefully, but if you are looking (and always look with jacksmelt and herring) you can pick them out. Neither cod nor seal worms will kill you. If you eat one, they will typically pass right through you and you will never know. But sometimes they will successfully attach themselves to your stomach, causing nausea and abdominal pain. They’ll die soon enough, but not before being unpleasant. Tapeworms are far nastier. They live in lots and lots of freshwater fish, to the point that only the foolish would even think about eating a wild trout or largemouth bass raw. Tapeworms can live inside people and can grow to 20 feet long inside you. Ick! Unless it is farmed, skip the walleye sashimi. 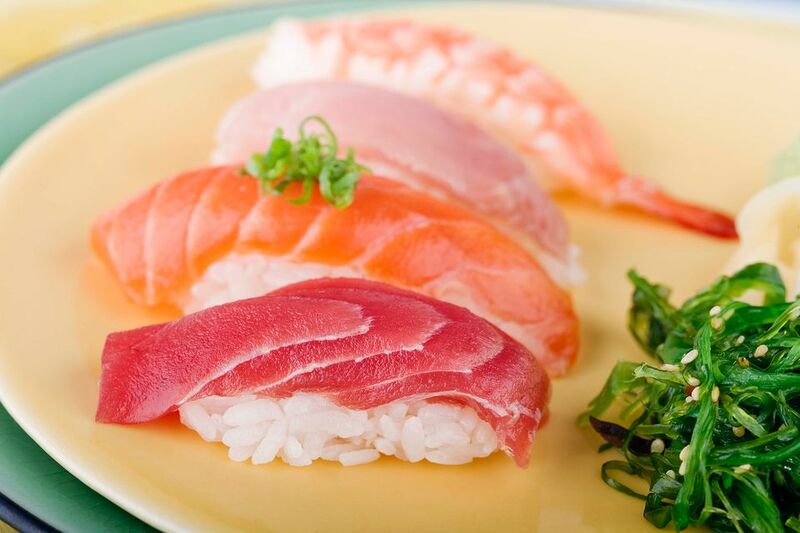 Another key factor in eating raw fish is freshness. it goes without saying that a fish that has not been treated well from the second it came over the rail of the boat is not going to be a good fish to eat raw. Sushi-grade fish are caught quickly, bled upon capture, gutted soon after and iced thoroughly. It matters. A lot. A piece of fish can be perfectly good to eat cooked but nasty raw. Cooking kills a lot of bacteria and such that begin to accumulate in raw fish after it dies. If you catch fish and want to eat them raw, remember which fish you can do this with from the list above. It is not exhaustive, but it’s a good guide. Bleed it by slicing through the gills and/or cutting a slice near the tail all the way to the backbone. Gut the fish on the boat. Most worms that are found in fish once lived in the animal’s guts, then migrated to the flesh after the fish died. Fast gutting prevents this in most cases. Bring ice on the boat, even in cold weather. Buy many pounds, and then buy one more bag: It’s worth it. Don’t let all of this scare you: Eating raw fish is a wonderful way to enjoy seafood; I eat raw fish many times a month. Just be smart about what you’re doing and you’ll be fine.